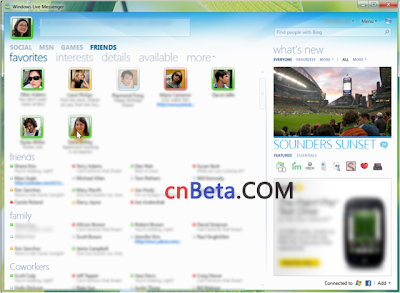 Windows Live Messenger 2010 Pictures has been leaked on internet. Microsoft is completely going to change the way and look of Messenger and its features. Let’s have a closer look at new Windows Live Messenger Wave 4 Milestone 3 screenshots and pictures. You can see WLM 2010 is completely changed from its previous released of Windows Live Messenger 2009. In WLM 2010 you can see "Social Panel" separately showing the updates of your all social networks (Facebook, Twitter etc) and on right panel you can see Windows Live Contacts list. 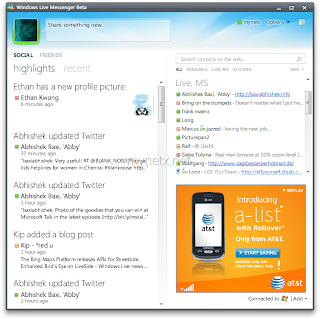 Windows Live Messenger 2010 also appears to have support for more popular social networks than just Facebook, Twitter and Windows Live, similarly like Windows Phone 7 Series is receiving. Facebook is not only showing your friends status update and latest feeds but also it will show you photos, profiles, news and more updates. Microsoft is also going to integrate SkyDrive support in Windows Live Messenger 2010 so that users can access their online data quite easily from Messenger It self. Microsoft is also adding some new Emotions and Winks in new messenger. So just wait for the final build.